Do NOT adjust your computer screen. 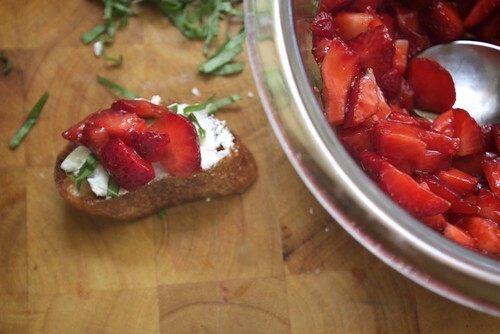 That really IS strawberry & basil you see on a crostini. This bruschetta is a riff on the oh-so-fab Caprese salad, except we substitute fresh mozzarella with GOAT CHEESE and tomatoes with STRAWBERRIES! And what do we get?? Crazy deliciousness! 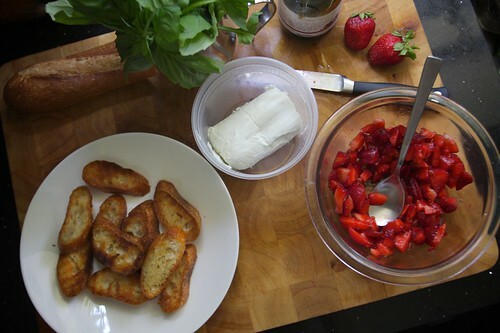 The strawberries are mixed with a little bit of balsamic vinegar, which brings out their underlying tang & sweetness. 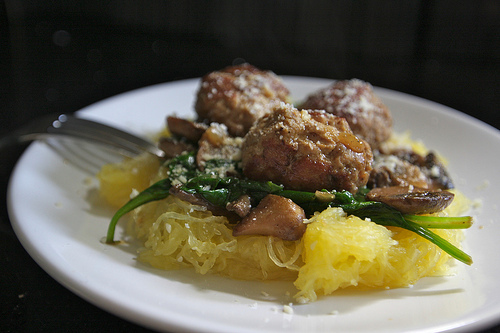 Shreds of basil provide some greenery and a hint of sophistication! And the goat cheese…it’s just pure decadence. 1. people will scratch their heads. 2. they’ll eat a few. 3. guests will fight over the last one! I like to call them The Unusual Suspects. No one suspects how good they are, and then they’re all gone. Gather your ingredients. Cut your bread. 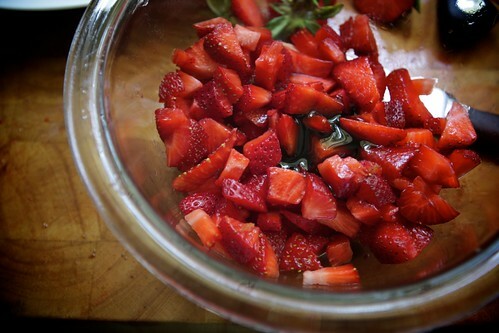 Chop up the strawberries and put a little balsamic in them. Stir. Let sit. 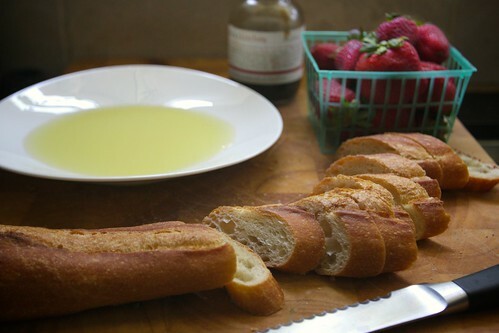 Brush or dunk both sides of the bread slices with olive oil. Grill each side for about 3-4 minutes until nicely browned. Get your bruschetta making station together. 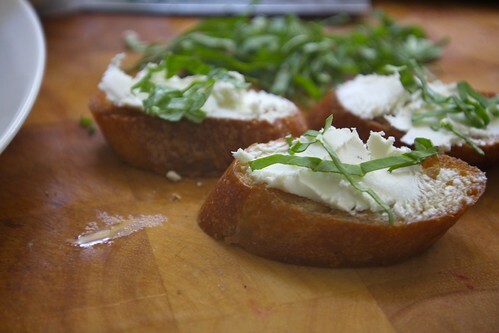 Top each crostini with goat cheese & basil. And then add a spoonful of strawberries on each one. Sprinkle with salt. Line them all up on a plate. Put cut strawberries in a bowl with balsamic vinegar and let sit for 10 minutes. 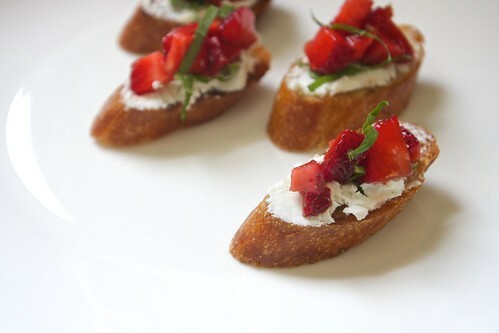 Spread 1 tablespoon of goat cheese on each crostini, top with a few basil shreds and then place a spoonful of strawberries on top. 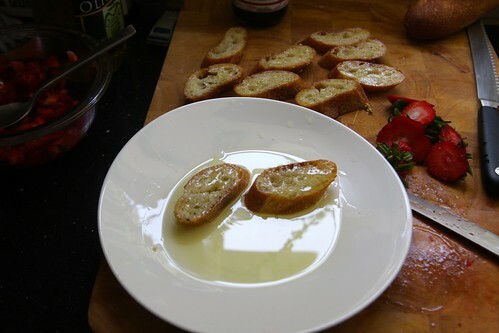 Sprinkle salt on top of the crostini & serve. Put oven rack in upper third of oven and preheat oven to 350°F. Put bread slices in a large shallow baking pan and brush slices with oil on both sides. 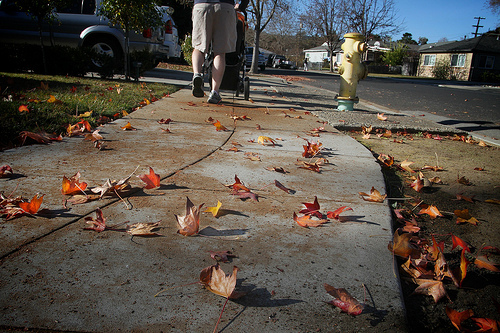 Season lightly with salt and pepper, then bake until pale golden, about 10-15 minutes. 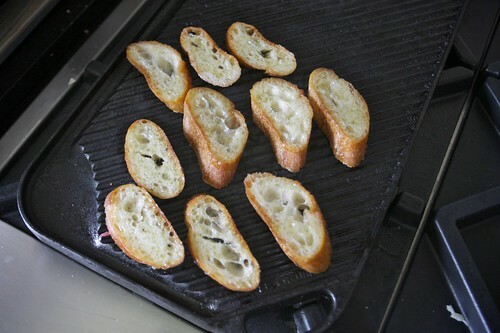 If you are grilling the crostini, heat over medium high heat and grill each side for 3-4 minutes. -You can get anywhere between 18-25 slices out of a baguette depending how thick you cut the slices! -You might have to cut the strawberries extra small. This depends on the diameter of your baguette. -Don’t forget to sprinkle with salt at the very end. It’s soo good! Yum! I think strawberries and goat cheese are the best combo. i bet your monitor doesn’t taste very good. Greetings from California! i just went strawberry picking and i’m in desperate need (yes, i am highly dramatic) of a way to use these berries up. they’re glorious. hi! i want to go strawberry picking! 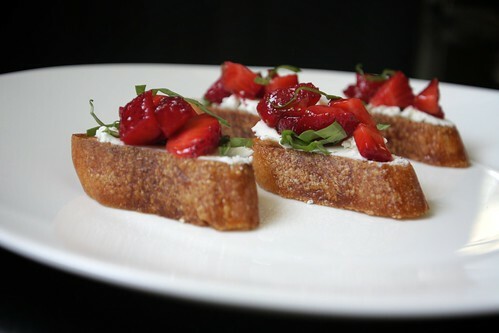 one of my favorite snacks is cream cheese and strawberries on crostini, this takes that to a whole new level! i’m excited to try this out. plus, doesn’t everything taste better on a toasty piece of bread? yum yum yum. try banana, cream cheese & honey on a graham cracker. It’s killer. JUST in time for my Memorial Day BBQ but I swear, girl, you are KILLING my diet with all this fab food you’ve posted lately! Eat some!! Just use moderation!!! 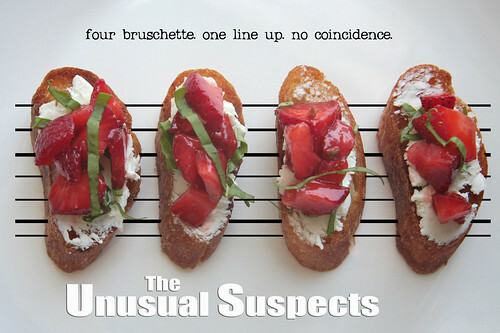 Whoa, I like the idea of a sweet-style bruschetta…especially with goat cheese, which I love. This seems like just the type of thing to bring to a party and wow everyone around you. Beautiful colors, too. 🙂 Thanks for sharing! yes. do it. bring it to a party!!!! Mmmm so tasty looking! Love this. 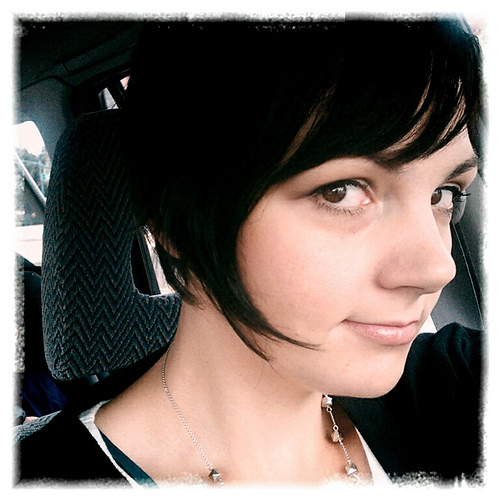 Hey, just wanted to say I love your podcasts with Joy! 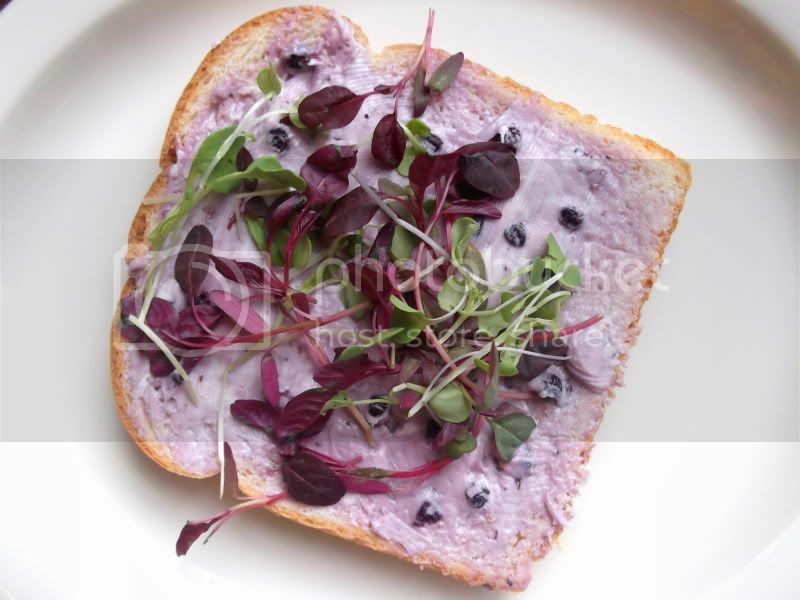 goat cheese mixed with blueberry preserves, spread across your favorite soft bread and topped with micro greens. Yum! goat cheese is awesome! how did I ever not like it? yum! i did something similar with a cherry star anise jam and some thyme on crostini! It was ah-mazing! Bruschettas are one of my all time favorite things.. Hell give me a fresh baguette and cheese and I’ll be happy. I’ve never tried a strawberry one. I can’t imagine it NOT being delicious. seriously! what is it about bread? Yum! We’ve been doing a strawberry balsamic salad here the past week. We found a dark chocolate flavored balsamic vinegar here in Portland at Benessere that takes anything with Strawberries in it to 11! HOLY MOTHER!! I need some. If someone made this, I would totally try a piece. I’m making myself try goat cheese 10 times this year in an effort to try to like it (think I’m up to 5 with only one success: a mild herby one). The other toppings sound brilliant! There’s TOTALLY hope. I remember hating goat cheese when I was younger. HATING it. I didn’t understand why my mom and brother were so gaga over it. Somehow I grew to like it! 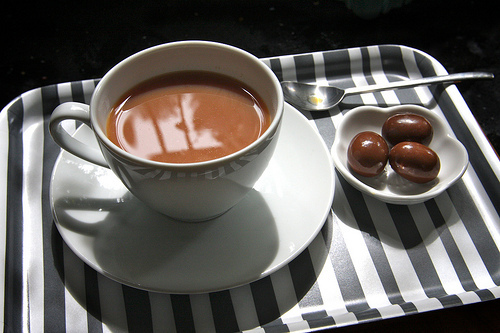 Maybe you should focus on the creaminess and try ignoring the tang? I think the strawberries would help! Yesterday one of my friends said she should make a series of gifs of my face while trying different cheeses. Goat cheese would definitely be the most amusing. That’s a good tip…I’ll try to focus next time! listen to your friend. then send me that animated gif. 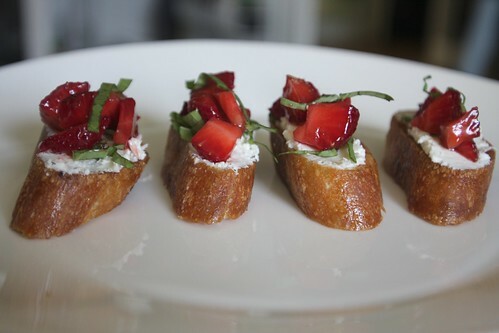 I was already addicted to your strawberry goat cheese salad but once I will have tasted those bruschettas I don’t think I’ll ever see strawberries as dessert again ! I’ve done something very similar but we make them outside on the grill in the summer; adds one more dimension I love. I sprinkle mine with a bit of toasted walnuts. And the truth is…not unlike quiche…real men like them too! Hi there ! 🙂 you have an Italian visitor!! I’m Anna, and I attend the last year of culinary school here in Italy and some of your things are just really really really cute!! My mother is american so i can understand and visit this site quiet offen. Tell me what you are learning in school! I want details! Me and about 35 of my friends had a cook off/bake off party over the weekend and these were a huge hit! Even though I would technically call them an appetizer they won best side! (THANK YOU!) and 2 trays of them only last about a minute and a half if that. They were so so easy to make! Love it! 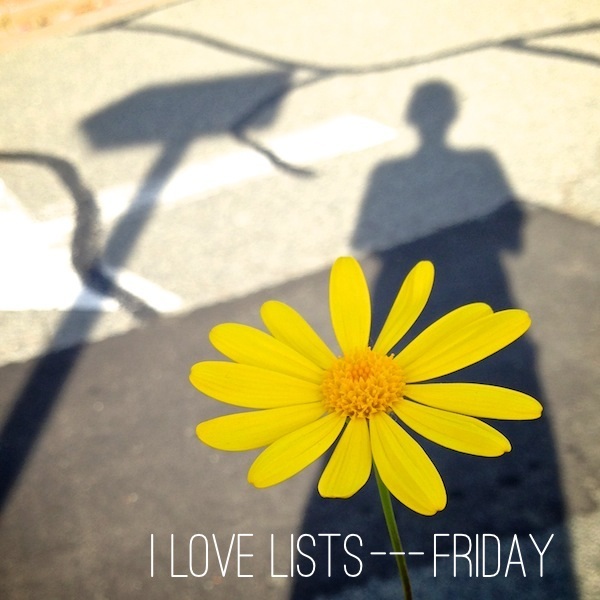 Made these MULTIPLE times now, emailed the link to friends and family… always a HUGE hit! I use strawberry balsamic too, which I love. Thanks for the great recipe. Hi Tracy! 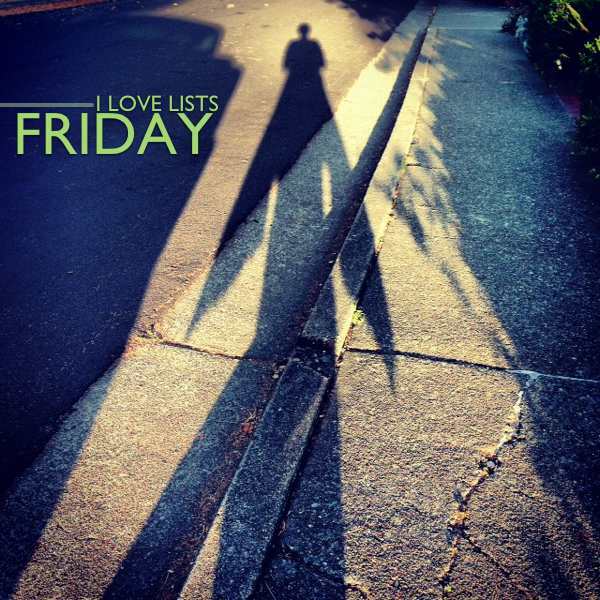 I found your blog via Joy the Baker. Love you both! 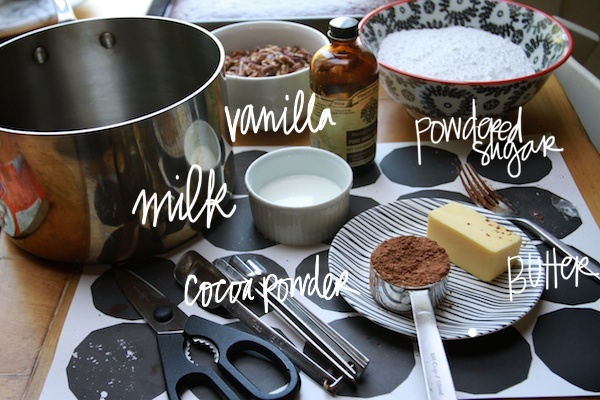 I made this recipe for my family for Christmas Eve and everyone loved and raved about it! 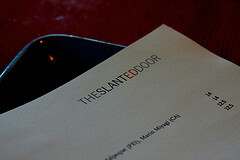 Check out my blog for pictures! Holy yes! All my favorite favorite flavors. I would eat a whole tray of these. After eating this for lunch for the sixth time, I should probably swing by and tell you that this is amazing, you are a genius for putting these things together, and I can’t imagine a better use for strawberries. Brilliant. tasty, tasty! thanks for sharing these again.